Nitrite-free engine coolants used to protect aluminum parts will lose some of their benefits when contaminated with different formulas or water, but Shell has a way to address the issue. Shell Rotella ELC Correction Fluid restores additives and extends the service life of Rotella ELC NF and Rotella ELC coolants. Once corrosion inhibitor levels are restored, Rotella ELC NF can also remain in service beyond 600,000 miles, the company says. 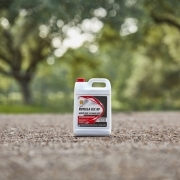 The formula can also be used to convert cooling systems from conventional fully formulated coolants to Rotella ELC without draining and refilling the tire system. Although, that still requires a specific plan developed by Shell personnel. The exact amount to be added can be determined using approved test strips, which measure the fluid’s condition and OAT (Organic Acid Technology) corrosion inhibitor levels.